By KarenCorrMay 2, 2017Bendigo, Greater Bendigo Curriculum for Change, Outside the Square, What Do You Reckon? 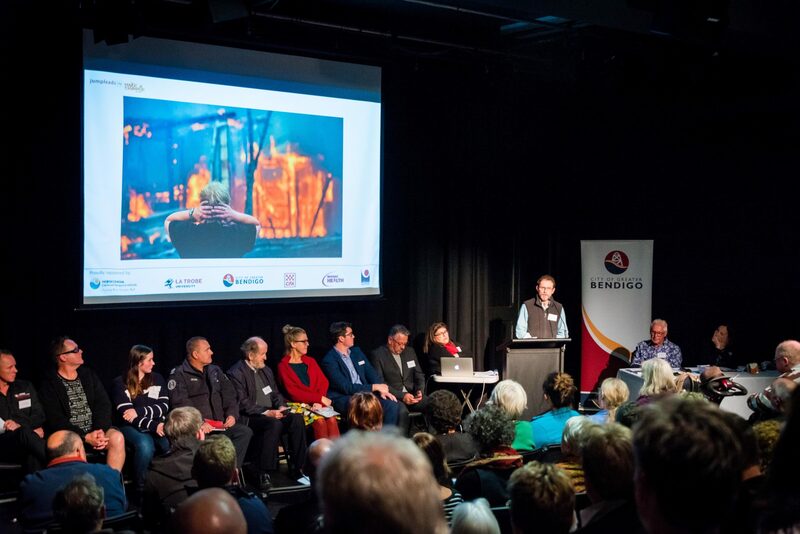 The Old Fire Station was buzzing with a full house last Thursday evening when 140 people including hosts and speakers attended an interactive forum on the theme ‘Resilience’. 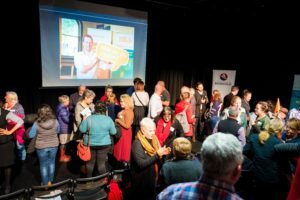 Hosted by Make a Change Australia as part of the series Greater Bendigo Curriculum for Change the forum encouraged attendees to think differently about strengthening their community. “Life seems to be more and more crazy these days. People are looking outside the square for solutions on how to live better and how to help make things better for others too,” said Karen Corr, of Make a Change. The event was funded through a grant from the CFA and the discussions included effective response for before, during and after emergencies. Cherie Graham from Blackwood Community Emergency Management Planning group gave a great example of how the Blackwood community has proactively created their own emergency plan in partnership with the Council and relevant agencies. And Janet Phillips from FRRR shared the story of Strathewan Primary School, who created their own DVD to educate themselves and others about how to be better prepared for a fire. The evening wasn’t all about responding to emergencies, as a way for our community to be resilient. W ilf Savage from the University of the Third Age highlighted issues such as loneliness faced by older generations and the benefits that groups like his provide. Adam Poyser talked about how being inclusive has built resilience for his business, and in particular the benefits of employing refugees who have brought their own experience of resilience to the Poyser Motor Group. 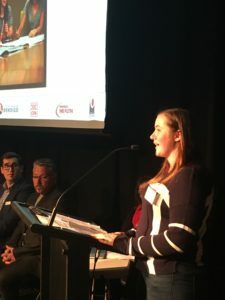 Ruby Baker, from Yo Bendigo, shared how she’s building resilience through initiatives that create social connections and provide support for young people. And Shane Richardson, who has an acquired brain injury (ABI), shared how he’s facilitating workshops for schools and how that’s helping to build resilience for himself and the school communities he presents within. The gracious and charming Keith Sutherland brought it all together as MC, with Karen Corr facilitating some great interactive discussions amongst the group. 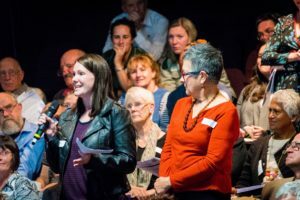 When audience members were asked to stand up and introduce their own projects, nearly 15 other initiatives confidently gained profile in the room. Interaction continued in an informal way for more than an hour after closing and a number of new connections were made and many new ideas were created. 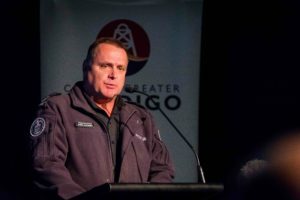 The final speaker of the night John Holton provided a moving ending to formal proceedings, talking about his direct experience of collecting stories after the Black Saturday Fires and of the healing role story telling plays in recovery. But breakthroughs were not limited to what happened in the room on the night. After engaging with people for nearly 2 months on ‘What Resilience means to you?’ A Make A Change, video ‘What do you reckon?’ posted on their Facebook page, has reached 42,000 people and 13,000 views to date. Make a Change organisers are encouraging locals to save the date now for the next two Outside the Square events in the series. “Don’t miss out and get ready for some great discussions headed your way!” says Karen. 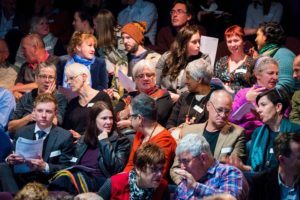 This initiative is part of Greater Bendigo’s Curriculum for Change: a series of discussions and events throughout 2017, underlining how each and every one of us can play a part in creating the future we want. 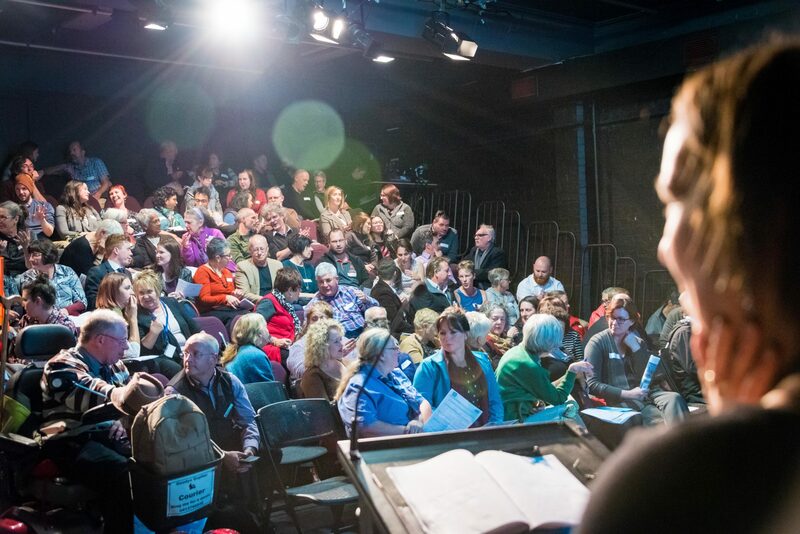 Sign up to the Make a Change e-news to stay in the loop, receive updates and event invitations !